This game has unused models. This game has unused sounds. This game is receiving new content, by way of Expansion Packs and/or Downloadable Content. Be aware that any unused content you find may become used in the future. If this does happen, please specify as such! This article is a work in progress. ...Well, all the articles here are, in a way. But this one moreso, and the article may contain incomplete information and editor's notes. Unused sounds (Ocarina of Time treasure jingle). 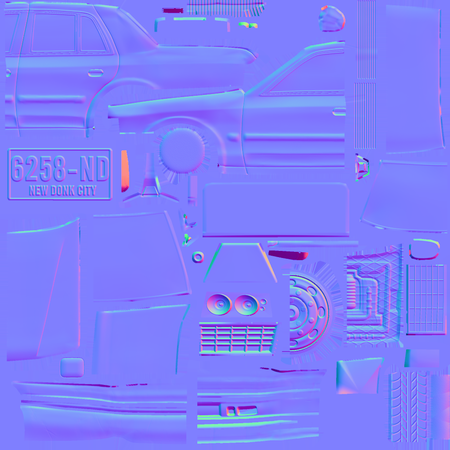 There are more unused graphics. 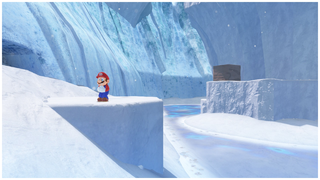 Super Mario Odyssey is an open-world 3D Mario platformer in the style of Super Mario 64 and Super Mario Sunshine, only this time you can use Mario's new found friend, Cappy, to cap-ture just about everything across its many kingdoms. An unused 2D sprite of small Mario. 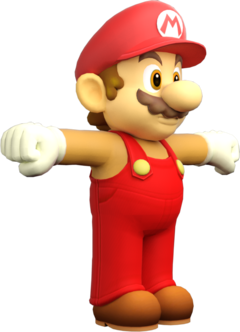 The final game only uses sprites for big Mario. 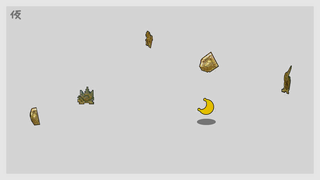 2D versions of the Metro Kingdom's regional coins (CoinCollectEmpty2D_E), which only appear in collected form. 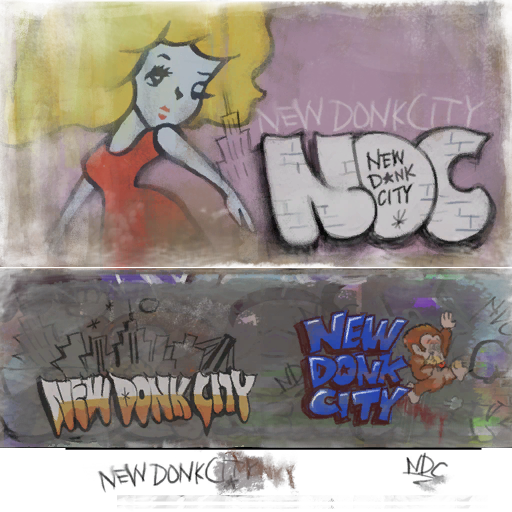 An early version of the New Donk City graffiti artwork can be found within the T-rex chase area. Pauline's artwork was changed, the tower was completely redrawn and the position of the logo was moved with minor touch-ups. 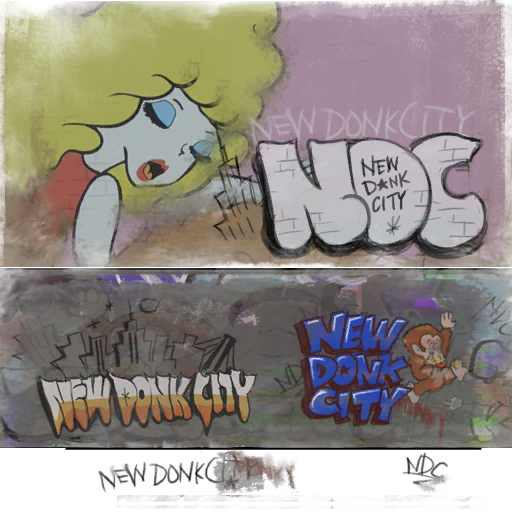 The normal map used by the broken down taxis in New Donk City is actually an early version of the one used by the standard taxis. The developers apparently forgot to update the normal map on the broken down taxis when they updated it on the standard taxis. The normal maps of models can be seen more clearly by using the coin filter of Snapshot Mode, which was added in the 1.2.0 update. The main difference between the early and final normal map is that the number plate of the early one says "6258-ND", while the final one says "1981-ND" (the release date of the original Donkey Kong). Replace screenshots with clean PNG captures. 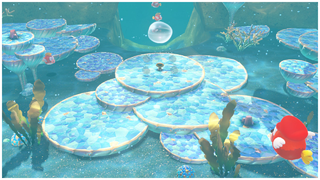 While Cheep Cheep placement appears to be the same, platform placement and the placement of seaweed appear to be very different. 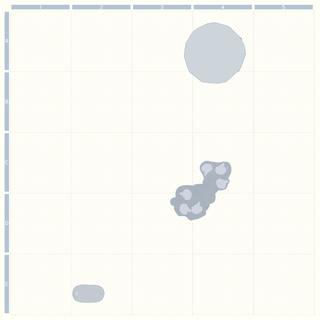 The carbonation effect of the water appears to not be present in the build where the early screenshot was taken. 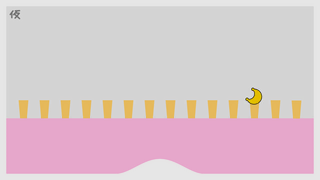 The lighting effects may be different or appear different due to the carbonation effect or the moved platforms. 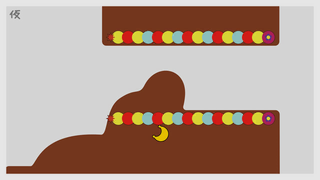 The bubble blower and 4 regional coins (already collected in the final game screenshot) were slightly moved up in the final game, due to the addition and movement of some platforms. This screenshot must have been taken near the completion of the game, due to it seeming almost exactly the same as the final game. 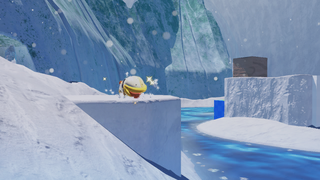 It is darker in the early screenshot, and the platform that Poochy is standing on appears to have rougher edges than in the final game. 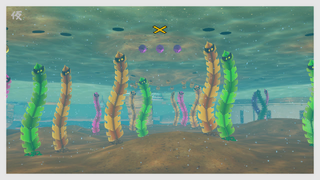 The early screenshot here includes an early version of the HUD. The HUD here appears to have slightly different versions of the moon icon, health bar, and minimap. 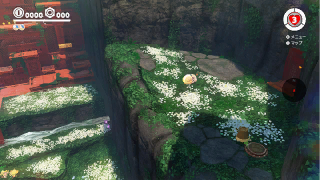 There are not many immediately noticeable differences in the landscape of the Wooded Kingdom, but the lighting appears to be brighter with a bloom effect. The version 1.2.0 update for the game adds a whopping 20 additional thumbnails (the first of which replaced the Wooded Kingdom's above), and all have the kanji for "Temporary" (仮) in the corner. 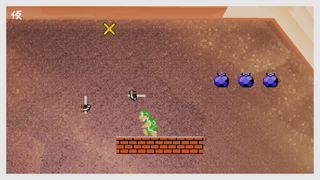 Updated versions of some of these Hint Art images were later shown on Nintendo's social media pages and in the Switch's news feed, pointing to the same locations, where players can now find hidden 8-bit Luigis (and 8-bit Captain Toads) and receive coins (provided they have connected to the Internet in-game). No additional Power Moons were added. 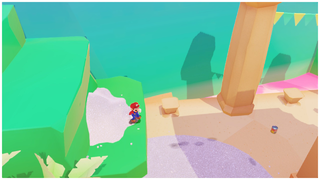 Leftovers from Super Mario 3D World's font can be found in the game. 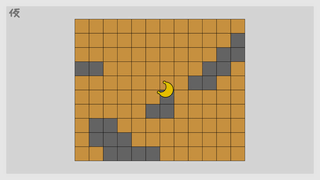 What's notable is that there is a new Power Moon icon as well, meaning that this font set isn't just a forgotten bit from 3D World. 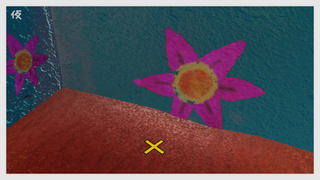 A lot of differences can be found on the early texture. 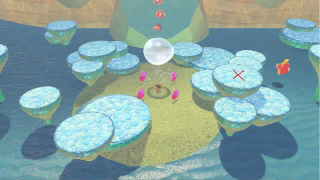 Isle Delfino (which remains in the game to the top left of the Mushroom Kingdom in the used texture) was to the top right with an unknown island having taken the top left above the cap of the Mushroom Kingdom island. The Cap Kingdom island was green rather than black and had no surrounding islands. The shape of Fossil Falls island in the Cascade Kingdom was a T-rex skull instead of a triceratops skull. There was no alpine island-like formation near the Lake Kingdom. 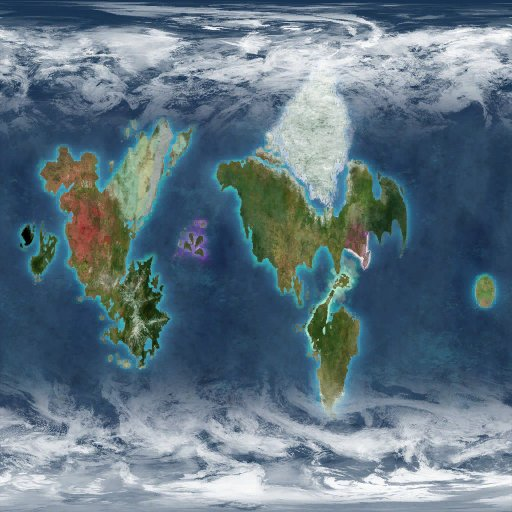 The Wooded Kingdom continent looked completely different, and did not look mountainous. There were less surrounding islands and no surrounding poison at the Lost Kingdom. 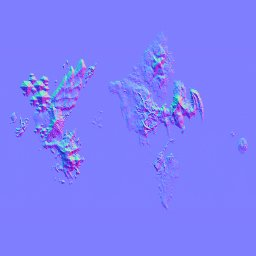 The Baja California-like peninsula (Where the Metro Kingdom is) looked a lot less noticeable. The champagne bottle island, located near the Seaside Kingdom, was facing more upwards and did not look like it had any champagne coming out. There were no snowy mountains below the big island where the Snow Kingdom is located. The location of the Luncheon Kingdom seemed to be smaller and was in the shape of a fork. The Ruined Kingdom and Bowser's Kingdom looked a lot "greener". 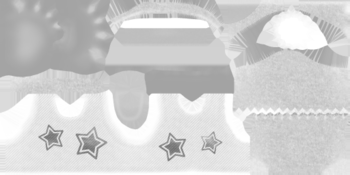 Overall, the entire texture was murkier and less bright in color. 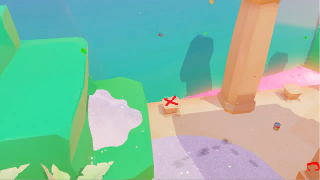 Isle Defino still remains in the Roughness and Normal texture of the Globe and it can be found in the game just by looking closely around the cap of the island of the Mushroom Kingdom on the Globe in the game. 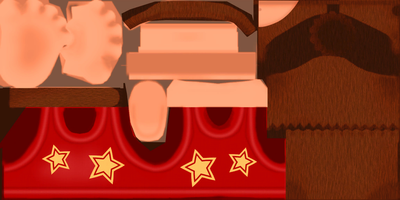 The early texture for Mario's Diddy Kong suit is overall brighter in color, and is missing the cloth pattern that goes over his shirt. 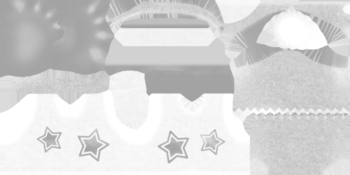 In addition, its stars are arranged differently and don't have the rounded edges seen in the final version. 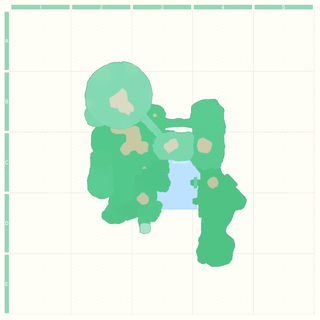 These changes are also reflected on its roughness map. 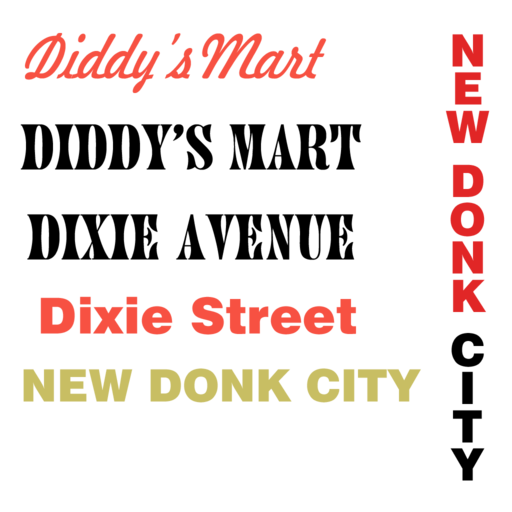 There's an image of some unused signboard text (TmpSignboardFont00) located in New Donk City's texture files that was likely a temporary placeholder used during development. It appears that Dixie Street was originally going to be named Dixie Avenue. Yoshi has unused swimming animations due to an oversight. Rip them. There's an unused animation of Pauline in her concert dress shrugging, in the final game, all she does is talk to Mario, dance and get interupted when she is hit. This seems to be an early ”bad answer” animation from her quiz, since an animation with the same name can be found with the mayor outfit, and it contains the final ”wrong answer” animation. There is also an animation of Pauline walking. It's a leftover from her mayor counterpart, who is seen walking casually. Pauline is never seen walking in her concert dress. That's not all, Pauline also has a scared animation, only used by characters when an enemy is nearby. 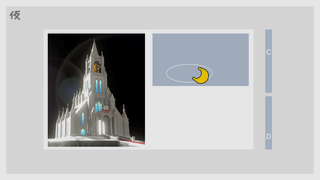 Seeing how Pauline with the mayor outfit has the same name for the animation file but with her final "scared" animation, it seems to be a leftover from testing. There seems to be unused "balloon" animations. They are labeled "TalkSmileBalloon and TalkBalloon". Unfortunately, the animations have been replaced with the normal "TalkSmile and Talk" animations. 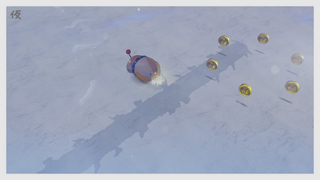 This possibly indicates Pauline was supposed to have a balloon quest of some sort. Peach has a testface animation. The name of it says it all, it was the see the limit of the face rig of Peach (how far can the lips and brows movement go). There is nothing too special about it as it seems to be a leftover from testing. Replace with a video with out commentary. 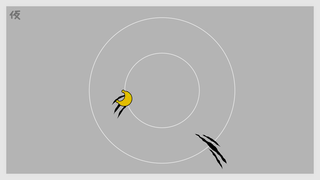 Originally, the tracing game in the Moon Kingdom was going to be in the shape of a star, but in the final it was a circle. Inside various BYAML files in WorldList.szs are references to removed test stages. A Link costume set was included alongside other costumes before v1.2.0. Link Hat A hat from a far-off land. Link Suit This outfit from another land comes complete with back accessories (sadly nonremovable). While every other costume not obtainable in the base game were periodically released following launch, this was the only costume that would never see the light of day. In v1.2.0, all references to the Link set were removed. 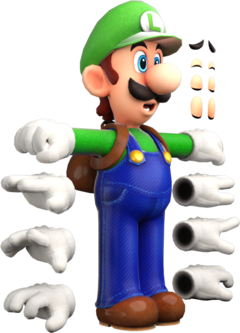 An early version of Luigi's model is present in the base game. 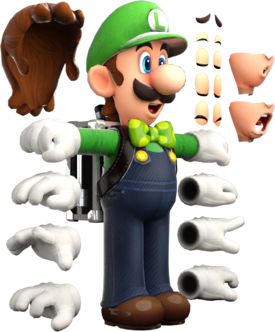 The final Luigi’s Balloon World model adds key features, including a bowtie, additional expressions and textures that match Mario's better. Luigi appears to be much darker and the backpack was changed to a suitcase with black straps. A Super Mario 3D World leftover model of Mario, with his outfit recolored to look like Mario's color scheme in Super Mario Bros..
A placeholder model for regional coins. A duplicate exists as CoinCollectM. 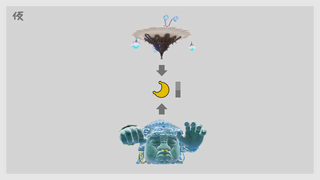 The jingle used for getting a Multi Moon during the "A Traditional Festival!" 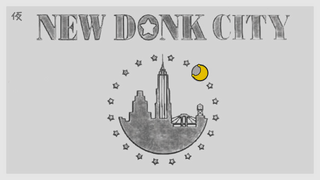 mission in New Donk City has an unused 8-bit version. 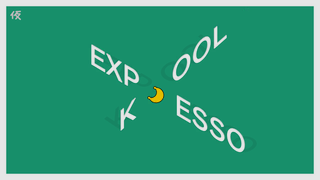 Find the file that contains the text for this test layout. 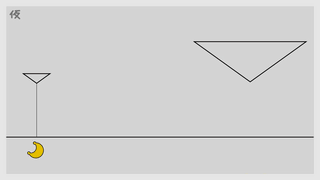 Located in LayoutData/TestText.szs contains a simple test layout with 3 animations: Appear, End, and Wait. The layout itself just includes a textbox with the name TxtTest00, with no text included. 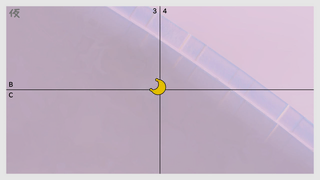 The triple Power Moons are called Multi Moons in the international versions. 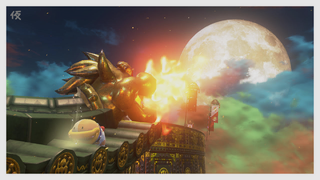 In the Japanese, Korean, and Traditional Chinese versions, they are called Grand Moons (similar to the Grand Stars in Super Mario Galaxy), as in the E3 2017 demo. In the Dutch localization of the game, some [not all] of the Steam Gardeners will end their dialogue with "*bzzzt*". Same difference in other localizations? 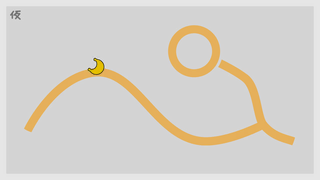 In the Dutch version, Moon 55 is called "M-A-R-I-O!". There are a few classes in the game's code that reference E3. There is a sequence director that tells the game which sequence to load: the main game (under the name "Hakoniwa"), or the E3 sequence (under the name "E3Sequence"). Of course, the game passes the former instead of the latter. The resource loader would load the resources used in the Sand Kingdom and the Metro Kingdom. It is theoretically possible to force the game to load this sequence by changing the string passed to SequenceFactory::createSequence(char const *sequenceName). There are multiple text files leftover from the prerelease demo used at E3 2017 and later events. Unknown characters/tags are replaced with the raw hex value in square brackets. The text can be found in can be found in LocalizedData\[region]_[language]\MessageData. 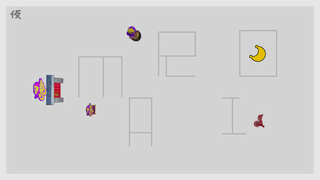 These appear, translated, in all the text files, even though the demo was only seen in English and Japanese. It isn't known where in the E3 demo this was used exactly, or if it was used. 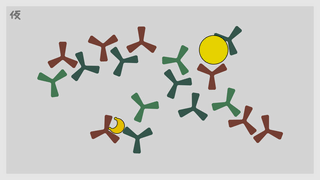 Used in the course selection screen. 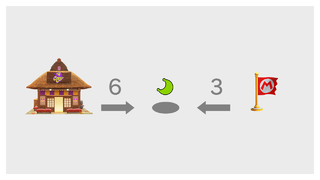 In the Metro Kingdom, there's a room with a 2D section and a music note that when collected, makes a group of them appear for Mario to collect in both 2D and 3D. This area has a second mirrored copy of the room stored just off screen, which cannot be seen without hacking and appears to serve no purpose in game. There are several unused kingdom scenarios in the game. Cloud Kingdom 4 Nearly empty besides the odyssey and the first 3 cloud platforms. 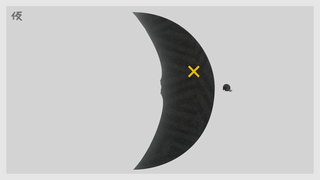 The only moon that remains is the one from the hint art. Ruined Kingdom 4 The odyssey is missing, and by extension, the landing cutscene is skipped. 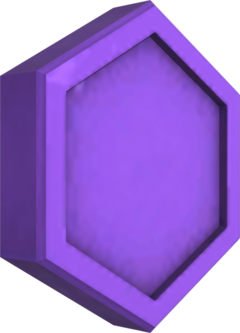 The wire to the boss arena, some invisible coins, and all objects in the boss arena are all missing. Dark Side 2 Part of the carrot tower is missing, all the doors to sub-areas are missing, and the loading zones are gone too. Darker Side 2 Pauline is missing. This version fixed a sequence break in the Cascade Kingdom that made it possible to jump around a Nintendo-grade™ invisible wall and go straight to the boss without collecting any Power Moons beforehand. This version adds support for the Korean language. This version adds Balloon World, a minigame starring Luigi that's unlocked after completing the main game, as well as a plethora of new outfits (most of which are time-locked). It also adds a few filters to Snapshot Mode, adjusts the difficulty and fixed a bug that allowed people to easily max out the score for the Jump-Rope Challenge (resetting the leaderboards in the process). The Sand Kingdom's Hint Art for the Bowser Kingdom was changed so that the Checkpoint Flag has a red pole instead of yellow. 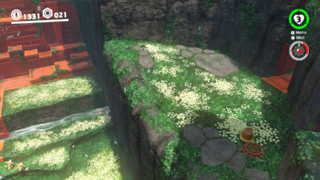 The four grassy platforms in Cascade Kingdom have been added to the map since in the original, after beating Madame Brood, the platforms locating a Power Moon and some Regional Coins was absent. Also, before you collect the moon for the mission, "Our First Power Moon", the bridge is up. When you collect it, the bridge falls down creating a pathway to where the Odyssey is located past the Waterfall Basin. Somehow, in the original version, if you look in the map when the bridge has already fallen, the bridge still remains vertical. This mistake was patched out in the "Luigi's Balloon World" update. Dark Side's map shows various platforms and edges from an earlier version of the world. 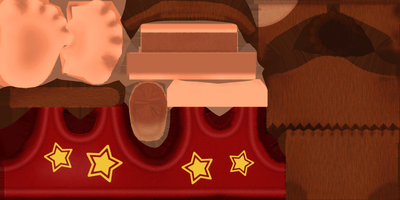 These bits were removed in the Balloon World update. 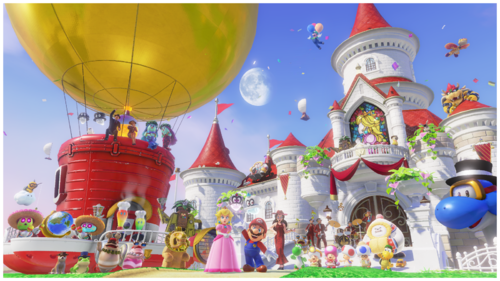 The picture you receive after completing the game has been altered slightly to add Luigi and his balloons in the background. The game's internal project name is "RedStar", according to paths in the executable. This page was last modified on 15 April 2019, at 20:02.